A huge part of the DCPSS mission is to place a robust focus on career planning for preteens through young adults. Yet all of us also realize that preparation for student achievement starts much earlier in a child’s life. This image from Roseburg’s Melrose Reading Station is arguably one of our favorites, because it so clearly illustrates the way all ages can read together and to each other. Just one more way we can choose to live out Education Matters! Summer daylight hours continue to shorten by a few minutes daily. Families are starting another school year. But there’s always time to encourage youngsters to start or continue a habit that will widen their worlds today and every day ahead. That’s reading, of course. Many kids need no encouragement to dive into pages and chapters. But even those children benefit from a good, old-fashioned sit-down with a book and an adult who loves them. Reading to or with a child is a pleasure for both participants. At the least, adults can ensure children have access to books they can read themselves for pleasure. 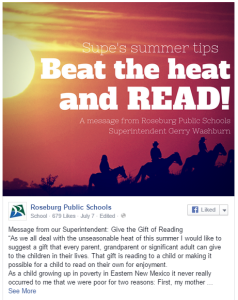 The new Roseburg Public Schools Superintendent Gerry Washburn noted in a July 11 guest column in The News-Review that we often overlook the simple things that can improve the lives of our babies, children and grandchildren. “While television, the Internet and computer games can introduce children to worlds real and imaginary,” Superintendent Washburn wrote, “they do little to organize that critical organ – the brain.” He also reminisced about his childhood summers in a New Mexico public library, where he embarked on adventures with Tarzan, Sherlock Holmes and the Hardy Boys. Now he’s choosing books to share with his grandchildren. Maybe it’s been a while since you sat down with a good children’s or teen’s book. If so, there are resources to help select age-appropriate books. Find reading lists, homeschool links and information on early literacy at the Douglas County Library’s children’s page. 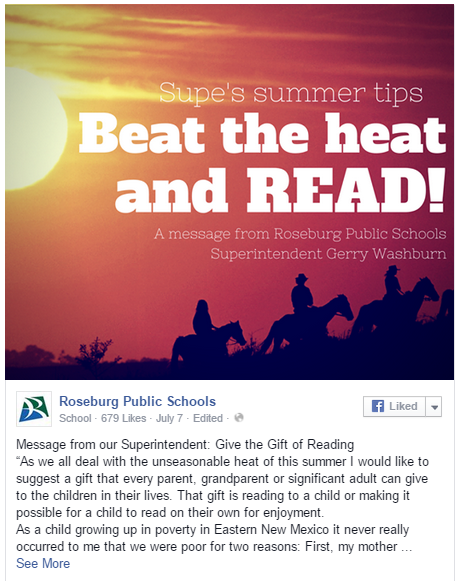 CLICK to read Roseburg Public Schools’ Superintendent Gerry Washburn’s full column on family reading time. You can also take children to your local library branch for Preschool Storytime. These half-hour sessions feature stories, songs and crafts for children ages 2 to 5 who are accompanied by an adult. Family and siblings are encouraged to come along as well. These storytimes are available at most branches, though some take a hiatus during the summer. Roseburg’s Preschool Storytime starts at 11:15 a.m. each Thursday in the children’s department. Other dates and times will be posted at the library’s storytime link as fall approaches. But you don’t have to be a parent or grandparent to help put local children on the path to literacy. The Douglas chapter of SMART, which stands for Start Making a Reader Today, deployed 132 volunteers in 2013-14 to help serve 337 children from pre-kindergarten through third grade. SMART aims to serve 405 children in 11 sites throughout the county in 2014-15. Find out here how you can make an impact. Reading is the simplest, yet one of the most effective ways to open windows of possibilities to children of all ages. Without literacy, kids are limited at every educational and career juncture. Summer 2015 will soon be a memory. But time invested now in boosting a child’s reading skills will pay off in the weeks, months and years to come. Besides, it’s fun. Go ahead and set your own household’s storytime. Tarzan and Sherlock Holmes are waiting.